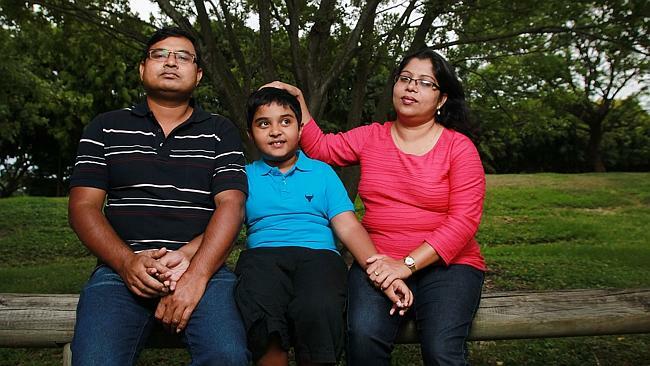 A BANGLADESHI family with an autistic son is waiting for the federal Immigration Minister Scott Morrison to personally intervene in their case after they were refused permanent residency because of the son's medical condition. Enamul and Siuly Kabir had their appeal to the Migration Review Tribunal knocked back in October because their son Srijon's condition could "likely result in a significant cost to the Australian community in the areas of health care and community services". But Enamul Kabir, who works as a statistician at the University of Queensland, said Srijon required no medication or therapy. But he does attend a special school and, if forced to return to Bangladesh, they will have to home-school him as local schools accept only "normal children". The Kabir family's plight came to light when a former colleague of Enamul Kabir, Christine McDonald, created a petition on the website change.org. In four weeks it has attracted 24,000 signatures. The family's solicitor Andrew Rouyanian said the Migration Review Tribunal decision was based on a technicality: the family was ordered to get a government medical officer to do an assessment of Srijon but instead organised a private assessment. When they were overdue for lodging their official assessment, their appeal was revoked. The case is now waiting for a decision from Mr Morrison, who can personally intervene. "There is discretion on the part of the minister that on the grounds of compassionate circumstances he can reverse the decision of the tribunal," said Mr Rouyanian. "Srijon has been here for five or so years. He's had the benefit of a special school and his doctors say his condition is improving. One doctor the family saw said if they were thrown out and sent back to Bangladesh then he'll be lost for life." A spokesman for Mr Morrison said the minister was aware of the case and was "waiting for a submission to be prepared for his consideration" by the Immigration Department. Mr Rouyanian said if the case were assessed on a net benefit approach, then the family should be allowed to stay. He said both parents held PhDs and were employed in universities in highly skilled specialist positions. "They've done their bit, they worked, they pay their taxes, they studied here. It just seems heartless to chuck them out."